There are no current global standards of training, practice and level of care for patients with neoplasms of the Head and Neck. There are significant variations in the quality and levels of care in various geographic locations in the world. The goal of the global online fellowship is to create a program to teach and train young surgeons and test their knowledge and thought processes, through which relative uniformity of knowledge base and judgment are measured and certified for specialists, through online education with continuous updating and monitoring of their knowledge base. The fellowship will involve a commitment of 2 years of self learning through a structured course curriculum, with periodic online examinations as the program progresses, until completion. During the course of the Fellowship the candidates will embark upon a 1 month observership and at the completion of the curriculum appear for an oral examination before an international panel of examiners. Upon successful completion of the oral examination a certificate will be issued recognizing the satisfactory completion of the course curriculum, and passing the examination. Such certification will ensure that the candidates have acquired an established global standard of core knowledge, and matured their judgment process through self education and successful completion of all examinations. The International Federation of Head and Neck Oncologic Societies (IFHNOS) has collaborated with Memorial Sloan Kettering Cancer Center (MSKCC) to develop an On line Fellowship in Head and Neck Surgery and Oncology, known as the Global On Line Fellowship (GOLF). We are happy to report on the number of surgeons throughout the world who have recently graduated or are currently participating in the fellowship. In the past three years, 258 board-qualified surgeons have registered for GOLF. 98 registered in 2014, 78 in 2015, and 82 in 2016. The first oral and final examination of this two year fellowship was conducted in October 2016 and 84 candidates passed the final examination of the fellowship and will receive their certificates in head and neck surgery and oncology, issued jointly by MSKCC and IFHNOS. 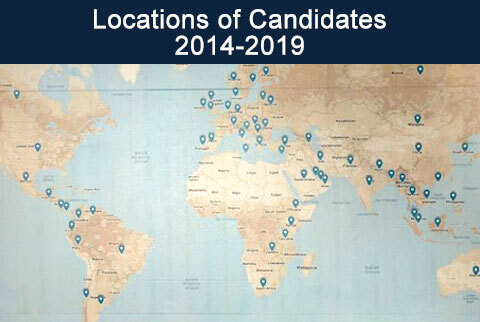 Candidates for the fellowship come from 2015-2018 come from 45 countries, including the United States, Mexico, Brazil, South Africa, India, China, Russia, Spain, Australia, and many others. The locations of the origin of the GOLF candidate are shown in Fig.1., which shows the global appeal of the GOLF program. Twenty experts serve on the written examination committee, which develops the quarterly multiple choice examination questions. Thirty senior leaders in Head and Neck Oncology participated in the oral examination of the fellowship, excluding traveling faculty and several others The 2016 oral examination was conducted in Delhi, India, Prague, Czech Republic, Rio De Janeiro, Brazil, Hong Kong, China, and Riyadh, Saudi Arabia. The oral examiners consisted of six members of the travelling faculty of the 2016 IFHNOS World Tour, and at each location six local / regional experts, for a total of 30 global experts. GOLF is open to board-qualified surgeons in their home country, anywhere in the world. The course of study requires self-learning through a structured course curriculum developed by an international committee of surgeons, and oncologists, including those from MSK, with quarterly online exams. During the fellowship, candidates are also required to complete a one month observership at one of the 35 approved observership sites around the globe followed by an oral examination before an international panel. Upon successful completion of the program, the fellow receives a certificate in head and neck surgery and oncology. A minimum of five years of surgical training following completion of medical school and Board certification (or equivalent) in the specialty of general surgery, otolaryngology, plastic surgery, or similar field in their country. Current engagement in Head and Neck Surgery training or practice. Certification and letter of support from the Head of the institution where the candidate conducts his/her clinical activities indicating a commitment by the candidate to the specialty of head and neck surgery and oncology, and current nature and tenure of employment. A complete list of operative procedures performed during the preceding year showing a significant proportion (over 50%) of head and neck cancer/tumor cases, where the candidate was either the operating surgeon or first assistant. Personal statement indicating commitment by the candidate to complete the Fellowship and future career goals to utilize the knowledge gained through this Fellowship. The goal of the Global Online Fellowship (GOLF) is to improve the clinical knowledge and judgment of Head and Neck Surgeons by enhancing their knowledge base and thought process through online education and periodic assessment. This will help overcome significant variations in the quality and levels of Head and Neck Oncology practices in various geographic regions in the world. The applicant must have a minimum of five years of Surgical training, following completion of medical school and Board certification (or equivalent) in the specialty of General Surgery, Otolaryngology, or Plastic Surgery, in their country. The applicant must possess basic knowledge and skills for management of cancers of the oral cavity, larynx, pharynx, para nasal sinus, skull base, salivary gland, thyroid, parathyroid, cutaneous cancers, soft tissue and bone tumors, and allied conditions. In addition, exposure to and training in Diagnostic Radiology, Radiation Oncology, Medical Oncology, Endocrinology and Pathology is required. The applicant should also be familiar with the management of patients with major surgery, including metabolism, shock, haemorrhage, sepsis, cardio pulmonary disease, renal and gastro intestinal disorders related to head and neck tumours. The fellowship involves a commitment of 2 years of self learning through a structured course curriculum, with periodic online examinations as the program progresses, until completion. It also requires a One month ‘Observership’, at a center of excellence in H&N Surgery. GOLF is not a degree or certification for practice of Head Neck Surgery and Oncology in your country. It is a tool to strengthen the judgment and skills of Head Neck surgeons and harmonize Head and Neck Oncology practice worldwide. The current version of GOLF is not designed for Oral and Maxillofacial Surgeons whose educational and training curricula and licensing of surgical practice is limited to only some of the topics mentioned above. However, some Maxillofacial surgeons with double degree (Dental and Medical), may be eligible to meet with the requirements as stated above. Please contact info@ifhnos.net for instructions.